This last week I spent lots more time balancing River TD, and I’m getting quite happy with it finally. While doing this (I’ve played River TD so many damn times… so so many times) I found some small rendering issues and cleaned them up. 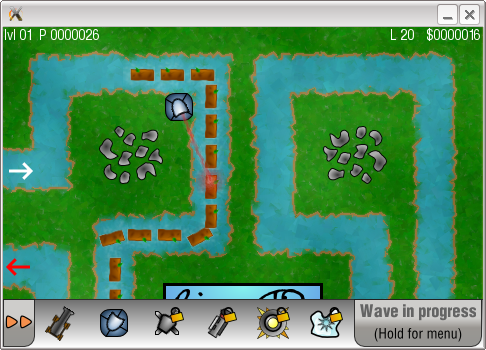 Air enemies render on top of land enemies. Health bar renders on top of everything (Before lasers would stop you seeing the health bar). 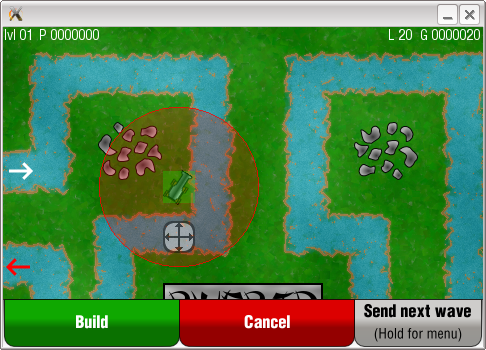 Refactor some code so that the [New Game] button works. Ability to make enemies loop when they hit the end of their path, so you have to eventually kill them. Always give the same amount of points for killing an enemy (Previously it decreased the longer an enemy was alive). 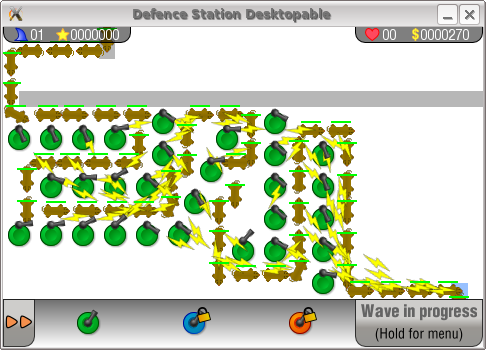 But of course… There is more 😉 I spent all Saturday (and another hour today) adding pathfinding, just like the flash based Desktop Tower Defence. This entry was posted in DSP, PSP on January 19, 2009 by Danzel. Nothing much to report this week…. I put all of the enemies in order for the level and have begun balancing them, the rough cut I have so far is looking fairly good, if maybe a little difficult. Over the next week I’ll be playing and replaying until I am happy with the difficulty. I have a massive spreadsheet for enemies and another one for towers. One of the things I’ve found with the current development version is that there is no reason to build anything except laser towers.. So I’m trying to combat this, which is turning out to be a lot more difficult than I expected! This entry was posted in DSP, PSP on January 12, 2009 by Danzel. I’ve added laser weapons and replaced the harpoon gun with a laser instead. 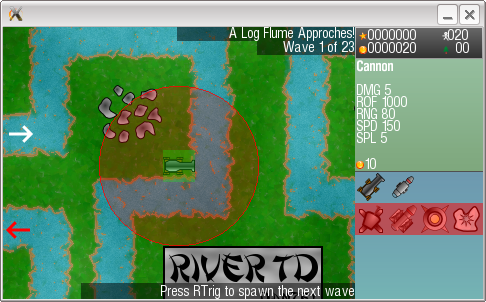 I’ve reduced the size of RiverTD to 480×480 px so that it will fit perfectly on the MouseUI. I plan to redo the Gamepad/PSP interface so it will fit on there too. I’ve added a fast forward feature, so you can zip through the waves. 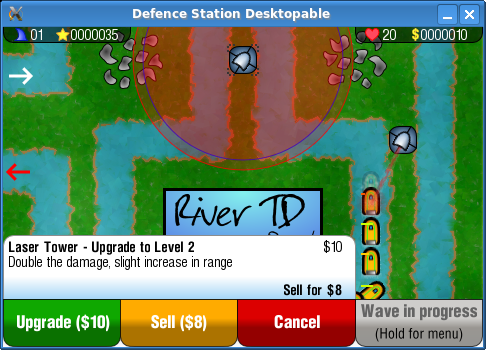 Added the ability to sell towers. Added descriptions to tower upgrades. Made the existing tower descriptions more descriptive. The Gamepad (PSP) UI is broken at the moment, I plan to rejiggle it so that it is more like the Mouse UI, so I’ll fix it then. This entry was posted in DSP, PSP on December 27, 2008 by Danzel. If you have been watching the DSP SVN logs recently you will of noticed I checked in a draft for what the Mouse Interface for DSP might look like. I’ve started implementing it in a private SVN, I’ll sync up to SF.net when I’m done with it. You’ll notice in the draft image that tower upgrades have a textual description. This will effect the gamepad UI also, I’ll check this into the SF.net SVN once it is done. This entry was posted in DSP on October 6, 2008 by Danzel. If you’ve watched SVN lately(ish) you would of seen that I’ve abstracted almost all the system dependent parts. I’m going to have a go at compiling the SDL version on my Mac and then I’ll port RiverTD to XML. Update2: RiverTD is now ported to XML, I haven’t fully tested it but it seems to work. This entry was posted in DSP on August 2, 2008 by Danzel. I’m mostly done with this, but still have to clean up the sdl_psp/GameMenu interactions with Game. This entry was posted in DSP on July 14, 2008 by Danzel.